Our planet has never been warmer than it was last month, according to data released by NASA on Tuesday. Yes, you’ve heard some version of that story before, and you’re sure to hear it again and again in the coming years, but this time, it’s a bit freaky. The news that July was the hottest month on record comes as a relative surprise, because there hasn’t even been an El Niño this year—the natural climate shift that usually boosts global temperatures. In fact, 2017 started with La Niña conditions, which tend to temporarily cool the planet, yet we still wound up with a record anyway. That’s shocking, as well as compelling evidence that anthropogenic climate change is picking up speed. Using measurements collected from about 6,300 land- and ocean-based weather stations around the world, NASA scientists calculated that the planet’s average temperature during July was about 2.25 degrees C (4.05 degrees F) warmer than the long-term annual average. Technically, July 2017 now shares the record in a statistical tie with July 2016 and August 2016 in NASA’s 137-year temperature record — all three are within the margin of error. July and August of 2016 had a bit of extra help from an El Niño, and last month achieved the mark all on its own. 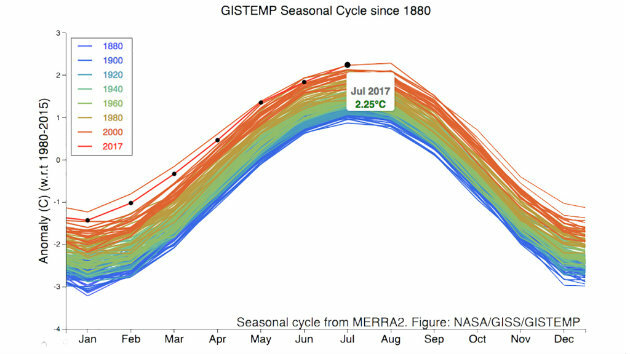 According to Gavin Schmidt, the NASA climate scientist who helps oversee the dataset, these three months are now “way ahead of the rest.” In a Twitter post, Schmidt predicted that 2017 will easily rank as one of the three warmest overall years on record, but probably won’t top 2016 as the warmest single year in history. Such a warm month during the peak of the Northern Hemisphere’s summer created a cascade of extreme weather conditions. In western Canada, the worst forest fires in nearly 60 years have already torched upwards of a million acres, more than four times what normally burns in an entire wildfire season. In California, Death Valley recorded the hottest month ever measured anywhere on Earth, with an average temperature of 107.24 degrees F. Several days topped 120 degrees. In Alaska, some cities recorded their warmest month in history, in part because of the early retreat of sea ice in the Arctic Ocean. “There’s basically now no sea ice left within 200 miles of Alaska,” the National Weather Service’s Rick Thoman told Climate Central. At the start of the month, the volume of sea ice across the Arctic was the lowest ever measured. In Europe, a persistent heatwave earned the name “Lucifer.” Spain recorded its hottest July day ever, with temperatures reaching 109 degrees F, and a drought in Italy prompted widespread water rationing. On its hottest day in history, Shanghai, China, saw a spike in fights and traffic accidents that the state-run media blamed on the heat. Temperatures exceeding 120 degrees F in Saudi Arabia prompted one engineer to invent an air-conditioned umbrella. All of this is evidence that our relationship with the planet is entering a new and dangerous phase. The good news is that, because we’re causing the shift, there are still things we can do to turn it around. But on our current pace—the fastest warming in at least 1,000 years— we’re quickly leaving the cozy climate that gave rise to human civilization.